The CLR Document Reader family contains high quality image capturing devices, which all meet the growing demand for security checks of personal documents. The CLR Document Reader devices can be used anywhere where automatic processing, archiving or verification of identification documents is a critical need. The CLR equipment has outstanding image quality in normal, UV and IR light, with an algorithm that results in an exceptionally high rate of character recognition. Additional unique features include reading 2D bar codes, creating full-colour UV images, and detecting documents automatically. Each of the four models in the CLR series are designed as optimum solutions for specific applications. They are easy to use, with no need for specially trained personnel. The equipment first senses when the document is inserted, then automatically creates the image and finally performs the analysis. During product development the designers particularly focused on the easy integration of CLR models. CLR products and their operating software are extremely easy to integrate with any complex computer system used for document control. After connecting the CLR Device to a PC, it takes a full image of the document and identifies its automatically. At the same time it detects the Machine Readable Zone (MRZ) on the input image. Within seconds it will also read the OCR (Optical Character Recognition) characters and (1D/2D) barcodes in this area, transforms these data into computer recognised (ASCII) format, and process them real-time or store them for further handling. This one device can be used in place of three others, the OCR reader, barcode reader and document scanner. It also eliminates the need for manual input. The CLR device takes up to 3 Mpixel true colour images of the entire ID page. It can use three types of illumination: white, infrared and UV light. These features make even the smallest patterns and hidden security marks clearly visible for additional manual verification. The whole process (image capturing with three types of illumination, data transmission and OCR process) happens in less than 3 seconds. In order to achieve the best performance and to make the usage more flexible, the all of the CLR devices is delivered with a clear, easy to use and comprehensive functions library. Using this library, it is possible to design and develop custom-tailored applications and meet special end-user needs. The API supports C/C++, Visual Basic, Delphi, VB.NET, C# and Java environments on Windows platforms. The device takes a colour picture in normal and UV illumination, and B/W in infrared illumination of the document placed on it. It transforms the image into computer recognisable format. 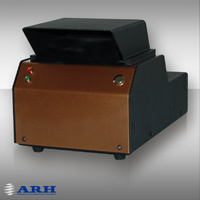 The software reads OCR lines, 1D barcodes, 2D barcodes, printed characters and special optical marks from the document. It transforms the data into computer recognisable format (ASCII). The processed image, the data read (OCR lines, printed characters, barcodes...etc) can be saved as an information package in an optional database created by the user. Afterwards it can be accessed and used by enabled users any time. - The operator puts the document (face down) on the glass window and the movement-sensing algorithm automatically starts the entire process. - The device takes a picture of the document and the software reads the data. - When the processing is successful, the CLR Device emits a brief signal for the operator. - Serve as a security tool in military, police, immigration, etc.